Dodd-Frank whistleblower reward submissions are treated confidentially by the United States Securities and Exchange Commission (SEC). The SEC protects Dodd-Frank whistleblowers to the fullest extent of the law and will not provide any information that could disclose a whistleblower’s identity in response to a Freedom of Information Act request, which is commonly referred to as a FOIA request. SEC whistleblower Rule 21F-7 discusses the confidentiality of submissions filed under the Dodd-Frank Act. 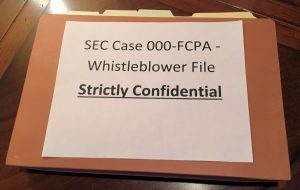 It explains that the SEC cannot “disclose information that could reasonably be expected to reveal the identity of a whistleblower,” with two notable exceptions. The first possible exception detailed in Rule 21F-7(a)(1) references a situation where the SEC files a federal court or administrative case against a company and has to provide information to the defendant company in connection with that case. For this exception to be invoked, an SEC-regulated company – very often a publicly traded corporation – would have to decide to challenge the SEC in a public proceeding. Though possible, this does not happen often because publicly traded entities typically like to resolve outstanding compliance and corruption issues with their regulators prior to a full-blown public hearing. When companies go to trial against their regulators, the companies’ investors become nervous and often the companies’ stock price goes down. But assume that a situation like this did occur, the whistleblower has likely provided substantial information to get the SEC to the point of trial and could be looking at a large reward if the SEC wins the case. 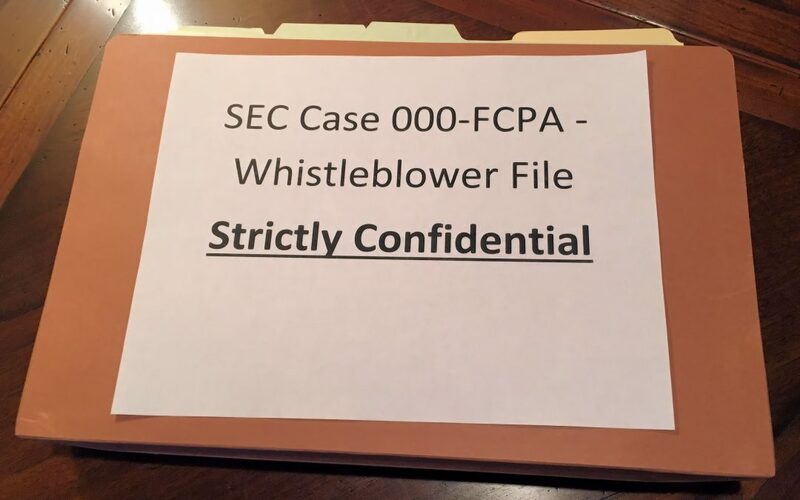 The other main exception detailed in Rule 21F-7(a)(2) provides that when necessary the SEC may provide the whistleblower’s information to other regulatory authorities, such as the U.S. Department of Justice (DOJ). Normally, if the SEC shares the whistleblower’s case with other regulatory agencies, then this is a positive thing because the other regulatory agencies may be able to help the SEC prove its case. The sharing of the whistleblower’s case with another agency, such as the DOJ, also could lead to the whistleblower obtaining a larger reward, as a qualifying whistleblower could receive a percentage of whatever additional monetary penalties that the DOJ levied against the company. If anyone has information about an SEC-regulated company – or an agent, subsidiary, or affiliate of an SEC-regulated company – making a payment or giving something of value, such as a trip, gift, or a job, to a government official, then he or she should contact me at arickman@rickmanlegal.com, as this could be valuable information. For more information about the Dodd-Frank reward program, please click here. And for more details about how the reward program applies to FCPA whistleblowers, please click here.